The story of La Tour and his bride sounds more like romantic fiction than sober historic fact, and indeed, much of it seems to be only vague legend, set going by the tales told by La Tour's rival, De Charnisay, who disputed with him the claim to the possession of Acadia, the present day Nova Scotia. Truth or fiction or a mixture of both, thus runs the story. In the town of Mons, in France, there was living early in the 17th century, a girl named Francoise Marie Jacquelin. According to the legend, her father was a barber. At the same time, across the sea in Acadia there was a gentleman of about thirty years of age, named Charles de La Tour. 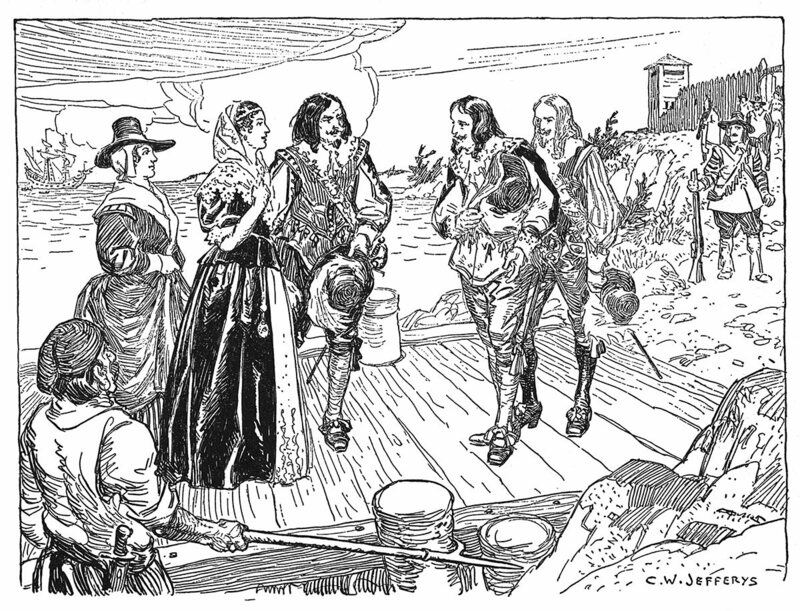 He belonged to a good family of Normandy, and, as a boy of fourteen, had come out with his father to Port Royal. He grew up in the wilderness, lived an adventurous life with the Indians, and was now a successful fur trader, with posts near Cape Sable, and at the mouth of the St. John River. 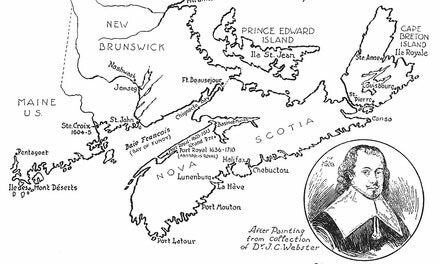 He was the feudal chief of a large portion of the territory now included in the provinces of New Brunswick and Nova Scotia. He needed a wife but there was no white woman in Acadia for him to marry. He was a busy man, and could not spare the time to go to France himself. So he instructed a friend of his, named Desjardins, to pick out a French girl, who would be willing to come out and marry him. Fate led Desjardins to the home of Francoise and he made the proposal to her, or to her family, which, in those days was the usual custom. They consented, and apparently Francoise-Marie made no objection. As we know from the story of her later life, she was of an adventurous character, and no doubt the romance of the affair lured her. And certainly, it was not every day in the seventeenth century that a barber's daughter got the chance to marry a gentleman of rank, and a prosperous one at that. Thus it was that she embarked upon a voyage that was to lead her to a life of strange peril, conflict and heroism, and to a tragic end. The voyage itself in those days was no small undertaking, and as the little ship slowly made its way across the wide waters, Francoise-Marie may have had qualms, not only of sea-sickness, but of repentance and foreboding of the adventure. When at length the forest-clad wilderness and the rocky coast of Acadia appeared, they doubtless looked forbidding enough to the young girl, and the rude palisaded fort promised little comfort or convenience. But we may be sure that she bravely tried to look her best as she stepped ashore in her gayest clothes to meet the man she was to marry. He, too, probably, would put his best foot foremost to make a favourable impression upon her. As it turned out, his friend Desjardins had made a happy choice; for La Tour and his wife appear to have been well mated, and equally fitted to meet the strenuous years they were to share. For the story of La Tour and his wife see Canada's Past in Pictures, The Ryerson Press, Toronto. 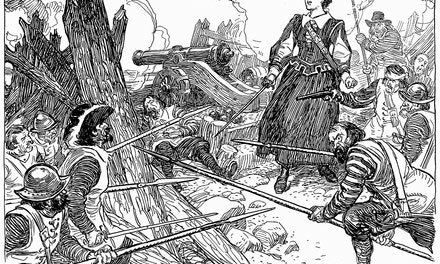 Inspired by their heroic mistress, the defenders held out against assaults continued day and night until toward the evening of the fourth day, Easter Sunday, Charnisay's men succeeded in making a breach in the palisades and entered the fort.